A magnitude 6.5 earthquake struck Indonesia’s Aceh province earlier today, leaving 97 dead and hundreds injured. Though the quake did not trigger a tsunami, it triggered memories of the horrific 2004 Indian Ocean earthquake when more than 100,000 were killed in Aceh alone. The US Geological survey said the shallow earthquake struck at 5:03 am local time and was centered about 12 miles (19 km) southeast of Sigli, a town in northern Aceh. 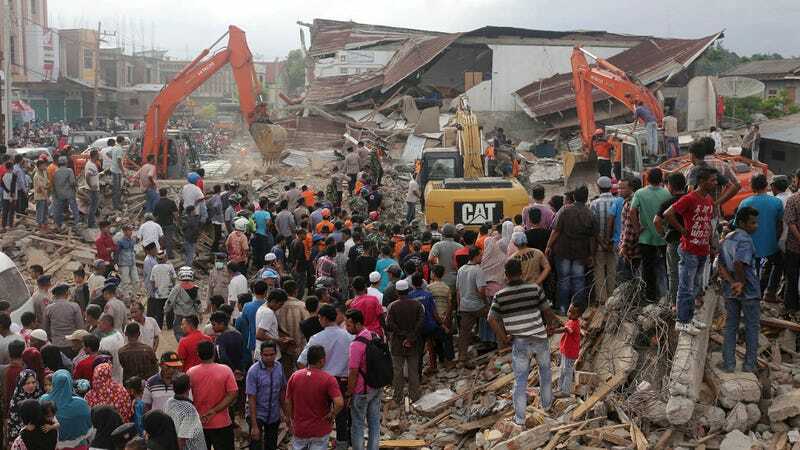 The quake has spawned a frantic rescue effort as thousands of villagers, soldiers, and police search for survivors in the rubble of dozens of collapsed and damaged buildings. The number of casualties is expected to increase. Local authorities say more than 500 people have been injured, nearly a quarter of them seriously. Nearly 250 buildings, including 14 mosques, have suffered major damage, mostly in the city of Pidie Jaya. Images show roads with cracks, cars crushed by fallen debris, and power lines that have toppled over. The conditions are making it difficult for rescuers to access some of the affected areas. To make matters worse, at least five aftershocks have been recorded since the initial quake, including a M4.8. Survivors are being treated in hospital corridors and hastily-built disaster tents. A Red Cross volunteer said health workers were struggling to meet demand, as there aren’t enough medical staff to deal with the hundreds of injured patients. President Joko Wikodo has ordered all government agencies to take part in the rescue efforts, and Red Cross Indonesia has dispatched its rescue teams.